U.S. Government To Pay $492 Million To 17 American Indian Tribes : The Two-Way The settlement resolves lawsuits alleging the federal government mismanaged tribal land, resources and money. The Obama administration says it has now settled more than $3.3 billion in such suits. 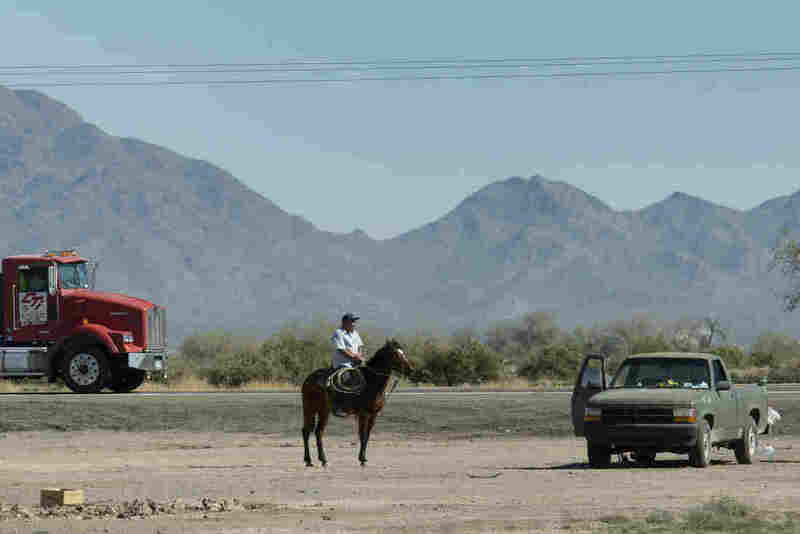 A road through the Gila River Indian Community in 2014. The tribe is one of 17 tribal governments the U.S. government announced Monday it had settled lawsuits with, over alleged mismanagement of land and resources. The U.S. government has agreed to pay a total of $492 million to 17 American Indian tribes for mismanaging natural resources and other tribal assets, according to an attorney who filed most of the suits. In a joint press release by the Departments of Interior and Justice, Secretary of the Interior Sally Jewel said, "Settling these long-standing disputes reflects the Obama Administration's continued commitment to reconciliation and empowerment for Indian Country." The settlements mark the end of a push by the Obama administration to resolve what the U.S. says is more than 100 lawsuits totaling more than $3.3 billion brought by American Indian individuals and tribal governments against the federal government. The policy of reaching settlements on the disputes, some of which date back more than a century, is part of a campaign promise the president made to American Indians before he took office. "Few have been ignored by Washington as long as Native Americans, the first Americans. Too often, Washington has paid lip-service to working with tribes," then-candidate Obama said in a speech at the Crow Nation Reservation in Montana in May 2008. "My Indian policy starts with honoring the unique government to government relationship, and ensuring treaty responsibilities are met." Those treaty responsibilities include agreements dating back to the 1800s that made the U.S. government the trustee for huge swaths of tribal land. The Department of the Interior says it manages almost 56 million acres of land on behalf of tribes, and handles at least 100,000 leases on that land for a wide variety of uses including housing, timber harvest, farming, livestock grazing, oil and gas extraction. More than 250 tribes have some assets held in trust by the federal government. Under those trust agreements, the U.S. government must make sure tribes receive "just compensation" for the use of their land or resources. "The government bought the land from Indians, but it didn't pay the Indians," says Melody McCoy, a staff attorney with the Native American Rights Fund who has spent 20 years handling lawsuits against the federal government over alleged trust mismanagement and underpayment. "The U.S. government would say it held the assets in trusts benevolently, for the protection of Indian lands and money," says McCoy, who handled 13 of the 17 newly announced settlements. "The flip side of that is that in exchange, the government was supposed to be a good trustee, and it wasn't. Land was not managed well. Money and resources were not managed well." The result was decades of allegedly lost income for Native Americans across the country. Before the Obama administration could turn to the business of settling the 100-plus lawsuits by tribes, it had to resolve a 13-year class-action lawsuit alleging the government failed to pay individual people billions of dollars in profits from land that had been seized from American Indians. A $3.4 billion deal was reached in 2009. The tribal lawsuits proved more difficult to settle, because they often concerned payments the tribes alleged should have been made over the course of decades. "There were substantial litigation risks and problems to both sides," which drove both sides to the bargaining table, McCoy says. By 2012, the administration had reached settlements with dozens of tribes. The settlements announced Monday are the second round of agreements. McCoy says that since Obama took office, there have been 95 total settlements with tribes, and that 11 more, some of which she handles, are in active negotiation. "It is quite an accomplishment," she says. Although most of the 17 settlements are still awaiting final court approval, a handful of documents have been released, naming the Muscogee Creek Nation of Oklahoma, The Colorado River Indian Tribes and the Gila River Indian Community. The settlements range from $25,000 up to $45 million, says McCoy, who has seen documents for 15 of the 17 settlements announced. She says the money from the tribal settlements will be transferred directly from the U.S. Treasury to tribal governments, and that there are no stipulations about how it will be spent. In a departure from more than a century of policy, the U.S. government now insists that tribal governments take the payments, refusing to hold the settlement assets in trusts. "Going forward, the U.S. certainly has an opportunity to treat tribes more fairly," McCoy says. As for the tribes she has personally represented against the federal government, she says they are pleased. "My clients feel like they had an extraordinary opportunity to engage with the U.S. government to government at the political level," she says.